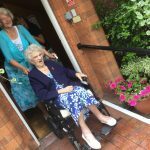 All stops were pulled out yesterday to celebrate the 100th Birthday of one of our residents Louie Duckham. The day started with Louie enjoying her breakfast with family opening her cards and presents although there was only one card Louie was waiting for and that was the one sent by the Queen which arrived mid-morning to Louie’s excitement. Louie had her cake presented to her in the main lounge while another resident Janet played Happy Birthday to her on the piano. 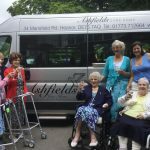 Louie was then taken a ride out in Ashfields new Minibus with her family and 3 friends accompanied by a bottle of prosecco which they all enjoyed by toasting Louie’s birthday and the first outing for the new Minibus. Louie arrived back to Ashfields with a big smile in time for lunch with her family which they had in the Summer Lounge together. 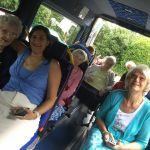 After a very brief rest Louie then went into the courtyard greeted by sunshine and all her friends at Ashfields to enjoy the entertainment. If that wasn’t enough excitement for one-day Louie was then visited by the Mayoress of Amber Valley. Louie was so surprised and happy she couldn’t get over it. 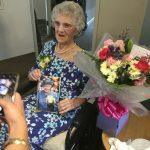 She said, ‘this has been the best day of my life’, ‘if I was still living in my bungalow I would’nt have all this would I?’ she was very happy. After the entertainment was over Louie and her family and friends shared a buffet tea in the Summer Lounge and they carried on celebrating until much later together as a family. Look out for more photos of this really special day. I will post them on as I get them.